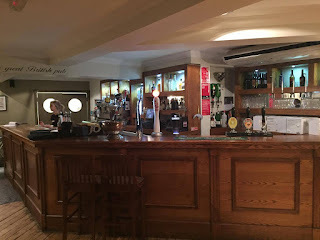 George's Tradition at The Thorn Tree Inn - Woodlinkin, Derbyshire. 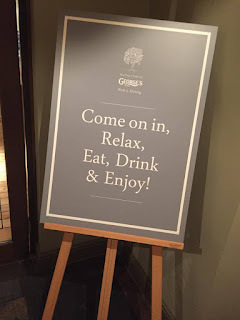 You might have seen one of my previous posts about the launch night at George's in Chellaston - click to view. 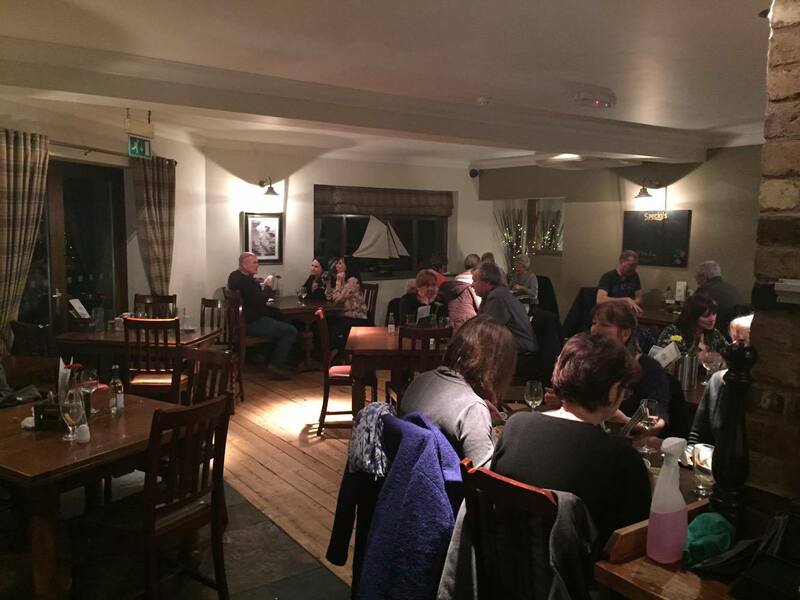 Recently, I was invited along to another one of the George's Tradition restaurants, The Thorn Tree Inn at Woodlinkin. If you're not sure where Woodlinkin is, it's along the A610 near Codnor, not too far from IKEA. 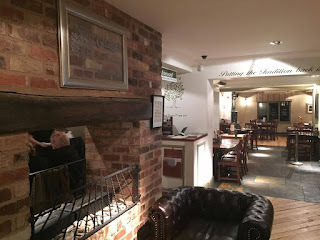 The Thorn Tree is a little different from the other George's as it is also a pub. It's a great place for some good grub, a refreshing drink and a relaxing atmosphere. 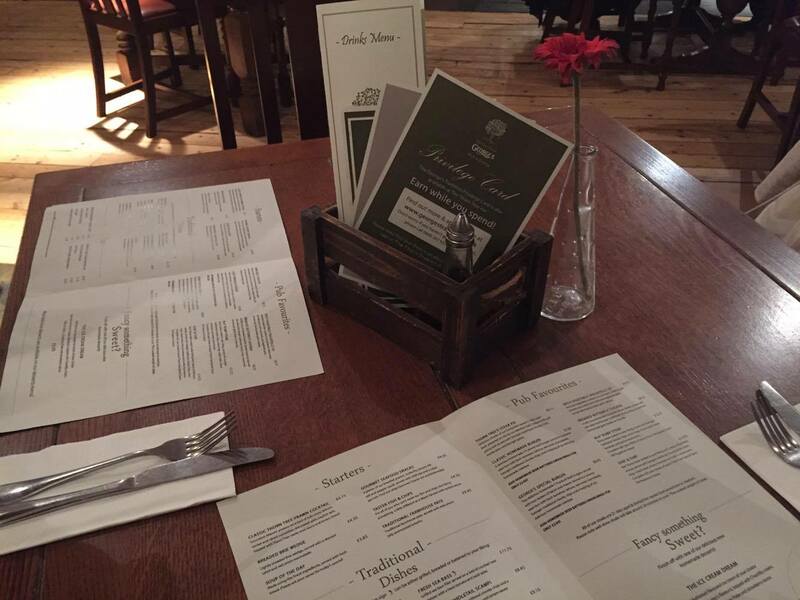 Everyone is welcome, whether it's a family meal, a get together with friends or a romantic meal for two. Also, to the side of the building is a takeaway. We parked up in the car park to the rear and headed for the front door. From the car park, we could see the lovely looking beer garden and terrace which is perfect on a warm summers day but unfortunately too dark to photograph. The bar area has a really relaxed feel to it which was nice to walk into. We were greeted by manager Guy and he seated us in the restaurant, left us with menus and pointed out today's specials. Shortly followed by a return visit to take our drink order. Both me and my mum decided to have starters and mains. Why not!? 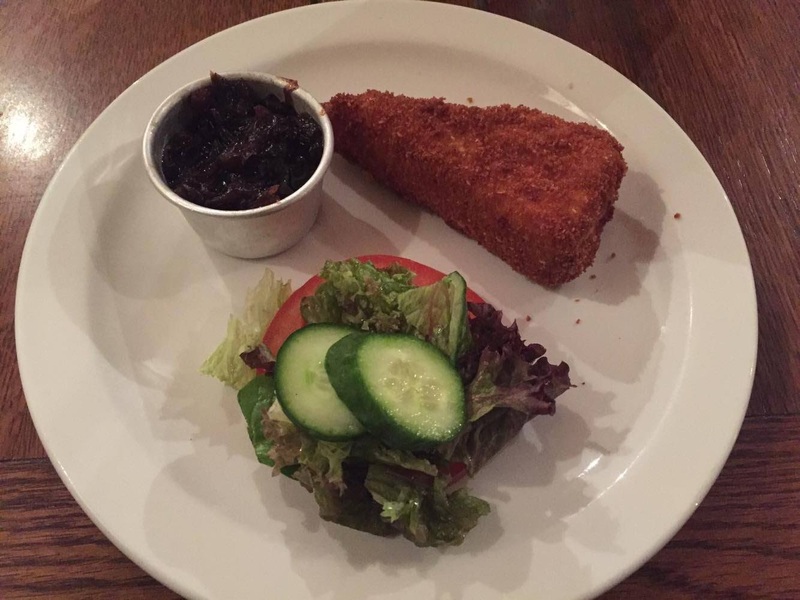 For me, a breaded Brie wedge with caramelised red onion marmalade. I've never actually had Brie before, so was excited to try it. I was very pleasantly surprised! The crunch from the outside with the warm gooey cheese centre was delicious, especially with the sweet marmalade. It all went great together. For mum, the classic Thorn Tree Prawn Cocktail. She told me it was lovely, the only thing she mentioned was no butter for the bread which would have been nice. There was a nice wait between courses, as we were chatting it went quicker than we thought! 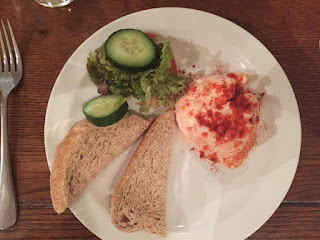 As George's are best known for their Fish & Chips, we decided to go for mains on the menu that were different to what you'd expect, just to show that they do plenty of other choices too. 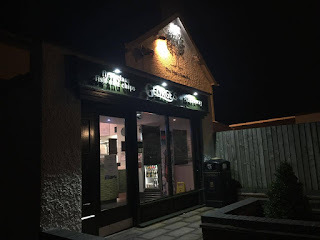 I had the breaded butterfly chicken (think I was having a breaded day) which came with chippy chips and home made garlic butter. I loved it! 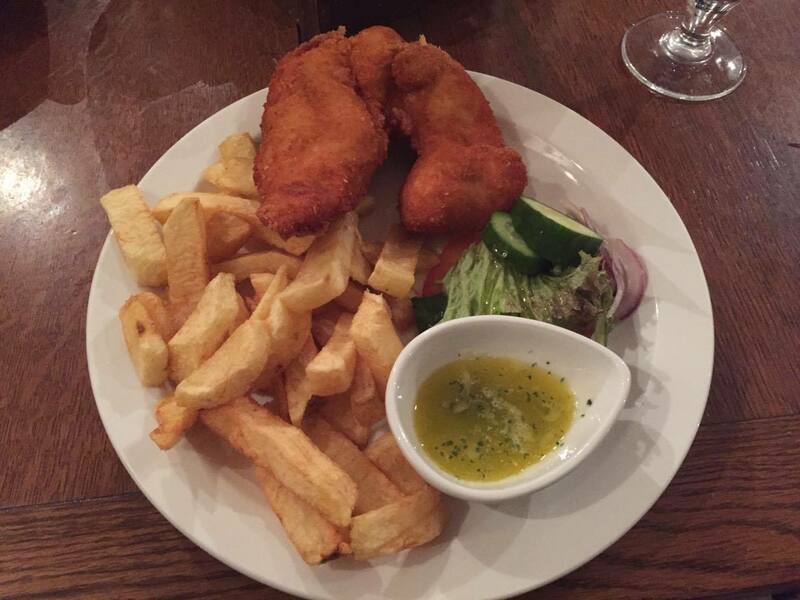 The breaded coating was crispy like the starter, the chicken succulent and went perfectly with the garlic butter and the chips delicious. I love proper chippy chips. It didn't take me long to demolish at all. Mum had the special, a pulled Lamb pie, I know it's a new one on me too. 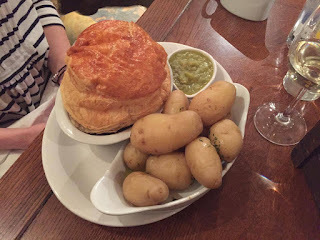 Okay, it's not a proper pie but it has a flaky pastry top! Guy had no problem with her swapping her chips for new potatoes which was great. 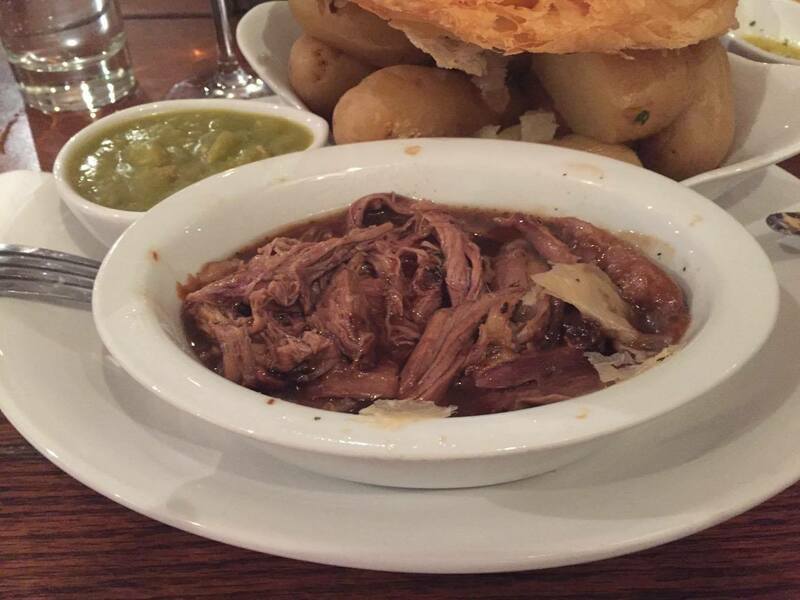 The Lamb fell apart, just like you'd want it to along with a melt in the mouth. The pasty top was a nice crunch go along with the filling and was very tasty. It was a popular choice that night, there were many coming from the kitchen. I tried some of the mushy peas as I couldn't resist. Lovely. Although she loved it, the portion size was very generous and mum couldn't handle the whole dish. No room for desserts unfortunately! After eating, Guy came over and had a chat with us which was nice. This gave me an opportunity to ask some questions too which was lucky! I've been to The Thorn Tree a few times over the years but I have to say, this was the best meal that I've had there by far. It's definitely improved! As it's not too far from where I live, it's super handy to have something like this so close. I'd recommend The Thorn Tree and all of the George's restaurants/ takeaways. They do amazing fish & chips.